Steph encouraging Libby to publish her column about (but not naming) Izzy. Karl reassuring Izzy that he'll be there for her and the baby, and Izzy tells him to tell Susan immediately. Libby takes Ben to the park to feed the ducks. When she sees Darren, she starts to leave, but has second thoughts and walks over to him. They make small talk, then Darren asks if they want an assistant – “I speak fluent duck”. The three of them walk over to the pond. Izzy emerges from the bedroom and notices that Karl hasn't left to tell Susan yet. Karl makes up an excuse – “Susan usually goes to the market about now” – but Izzy sees right through. Karl admits that he is putting it off. He was just starting to put things together after the separation, and now Izzy is pregnant. He feels like he's doing a juggling act trying to stop two worlds – his old life with Susan and his kids, and his new life with Izzy – from colliding. He admits that he finds moving on a little scary, then apologises for being a chicken. Libby, Ben and Darren return. Darren asks Libby to dinner, and Libby says yes, “I might need a friendly face when it hits the fan”. She is talking about her Izzy article in the paper. Izzy reads the article. “The little cow!” she mutters. Karl is about to leave and Izzy shows him what Libby has written. Karl is just as shocked. He tries to calm Izzy down by saying that it doesn't actually mention her by name, but Izzy says that everyone will still know. Izzy demands to know what Karl will do about it, but Karl tells her he doesn't think he can do anything. Lou reads the article outside his house, also surprised. He is about to unlock the door and go inside when he hears noises inside. 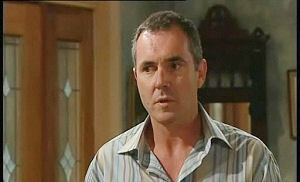 Lou comes knocking on the door and asks Stu to come and investigate his house. Stu puts his police hat on and follows Lou out. Libby and Steph sit down for some drinks. Susan comes in and asks what possessed her to publish the article. Libby tries to convince her it was about a legitimate social issue, but Susan doesn't believe her. “It was a direct attack on Isabelle and everyone is going to know. Your dad is a local doctor,” Susan says. “He should have thought about that,” Libby retorts. Steph tries to leave when she realises the argument isn't going to stop for a while, but Libby doesn't let her. Susan tells Libby it isn't doing her any favours, she's the discarded middle-aged wife in all this. It's hard enough for her to get through it and remain civil without having it aired in public. She tells Libby that Karl won't take it lying down. Next Max comes over and accuses Libby of character assassination. Lou slowly opens the door and finds out that the burglar has put the door chain on. Stu is about to kick open the door, but Lou stops him, because he doesn't own the house anymore. When they hear a loud crashing noise inside, Lou tells him to go for it. Stu kicks the door open, then announces that it's the police and the house is surrounded, so put your hands up. As the cameras pans across, we see Valda with her hands up. When she sees that it is Lou and Stu, she puts her hands down and starts laughing. Lou demands to know what she's doing in there. Valda tells them she's the girl from Ipanema. Libby realises she may have made a mistake and feels sorry for putting Steph in an awkward position. They check their phone messages, there's a new one from Lyn. She asks Susan to call back as soon as she gets it, it's important. Lyn is getting out of her car. Karl pulls up outside Susan's house. Seeing Lyn is about to go in there, he says he needs a private word with Susan. “How could you?” Lyn asks him. Karl tells her he's in no mood for her judgemental holier than thou attitude. 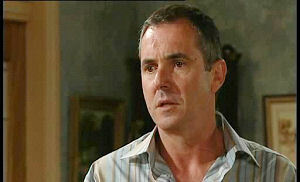 Lyn starts to ask “Haven't you hurt her enough already?”, but Karl is on his way in. Valda explains that she owns the Ipanema Investment Group, which means she owns the house. Lou is shocked. Stu apologises for the door chain and offers to fix it. “Don't worry,” Valda says, “the handyman here can do it.” Valda tells Lou she's moving in. “Like hell you are,” Lou says. “Tenants have rights!” Valda tells him he doesn't, he's been living there rent-free out of the goodness of her heart. She continues to throw out some of the ornaments and stuff in the house. Lou has an idea: he gives her $5 and tells her it's rent. She throws it down, but Lou tells her she's already accepted it, so he has rights. Valda tells him that there was no one around to say she ever touched it. “I'm contacting my lawyer,” Lou says. “What, Toadie?” Valda says, with a laugh. She leaves to go shopping, asking Lou to move his stuff from the master bedroom, and to get someone to check the wiring in the kitchen, she got a nasty shock from the power point. But it's nothing, she says, compared to the shock Lou just got. Karl tells Libby that what she did, attacking Izzy in a way she can't defend herself, was gutless. Libby argues back and Susan comes over to shut them up. She tells Karl that he said what he wanted to say, now he can go. Karl says he needs to have a word with her, in private. Libby goes over to visit Steph. 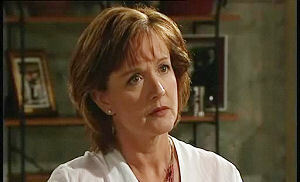 Libby tells Steph about the confrontation, saying Karl is a hypocrite. Libby wonders if she went too far, but Steph tells her she didn't. Izzy deserved it. Darren inspects the wiring. He tells Lou the whole house will need to be checked. Lou asks if it will be a big expensive job. Darren tells him he'll only charge Lou for materials. Lou tells him to go over the place with a fine toothed comb and charge top dollar, the owner has to pay for it now. Darren says it's strange being back in the house. Lou tells him that his mum would be proud of him now. He says he has some old home videos and offers to have a viewing one night with him. 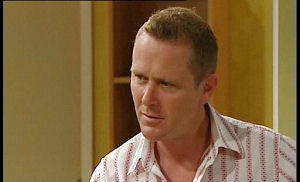 He asks Darren why he came back to Erinsborough to start up his business and Darren explains that he came back for Libby. Darren and Lou talk over lunch. 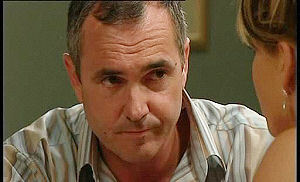 Darren laments that he lost Libby. But he's not leaving without trying to get back together with her. Valda and Lyn talk about Steph's wedding. Valda refuses to believe that Steph only wants a small wedding. The ladies see Lou and wave to him. Lou tells Darren to let him know when he gets the quote worked out. Darren asks if he's sure about what he wants, and Lou tells him he is. Darren waves to Libby, who is walking past, closely followed by Izzy, who tells her she wants a word with her. “I realise this is a big shock, “ Karl says, “but life has a habit of doing that. I'm sure we're all mature enough to deal with this in an adult way.” Susan tells Karl she wants him to leave. Karl does, but first says he appreciates her being so understanding. After Karl leaves, Susan breaks down and starts crying. Seeing a picture of the two of them, she picks it up and smashes it on the ground. Libby tells Izzy she was just reporting the facts. Izzy tells her she hardly knows her. The argument just gets bigger, with Lou, Darren, Valda and Lyn watching on. Karl, having just left the house, catches them and tells them to stop, but is interrupted by an understandably hysterical Susan. “I am not understanding! You are pathetic! You walk out our marriage after 30 years because you want to be free, and within minutes, you're telling me you're going to be a daddy again! And then you have the nerve to thank me for taking it so well?” Karl tries to calm he down, but fails. “Shut up and listen to me!” Susan continues. “I am not understanding. A couple of years I told you I wanted to have another baby, do you remember? And you said no. You said this was our time, time to do what we wanted, time to spoil ourselves. Well you spoiled my life. You have destroyed my happiness. And I am not understanding! From now on, Karl, expect nothing from me. I hate you. I hate you and what you have done to me and my family. And I will never, ever forgive you!” Susan goes back inside, leaving everyone in the street shocked at what they just saw, but no one is more shocked than Karl.